Yesterday was not one of my better days. I drive an hour each way back and forth to work on a major highway. Well, the car in front of me kicked up a tire tread on the road up onto the hood of my car. Yes people, it did leave a dent in my pretty car. Plus smears of black rubber. It is not worth fixing and luckily it's not that noticeable once I get the black stuff off. I had this happen with my last car and that time it did major damage to the hood and front of my car. I'm just glad it wasn't as bad as that. Then at work, I get a phone call from a patient's sister and she's reading me the riot act. Meaning yelling at me big time. I'm talking she thought I was a piece of sh*t on her shoe type yelling. Her problem wasn't even with me. Paperwork had been left on someone's desk for two weeks. When I asked her why she was yelling at me and not that person, she basically told me to go to hell and give her my supervisor's number which I promptly did. Now even though I know I'm dealing with cancer and it's very scary to patient's and their families usually I'm ok with people yelling at me. Usually I'm pretty good at calming them down and getting them to talk about how scared they are. Well there was no talking this woman off the ledge she was on. I went to my boss and told her what was about to be on her voicemail. I was quite upset at this time. I actually cried. I don't like to be accused of things I didn't do. I'll be the first one to admit I made a mistake, but not when I'm being made out as the bad guy when I'm not. It's a good thing that this only happens about once a year to me as my boss pointed out! Then the coup de grace? I was supposed to have date #2 after work, but he got stuck at work and now will be out of town for a week. I will have to be patient and hope he contacts me when he gets back home next week. So I had the triple whammy of bad yesterday and it sucked. I'm over it now, but for some reason, I was a crying beeyotch yesterday. I'm sure you guys have all had days like this right? 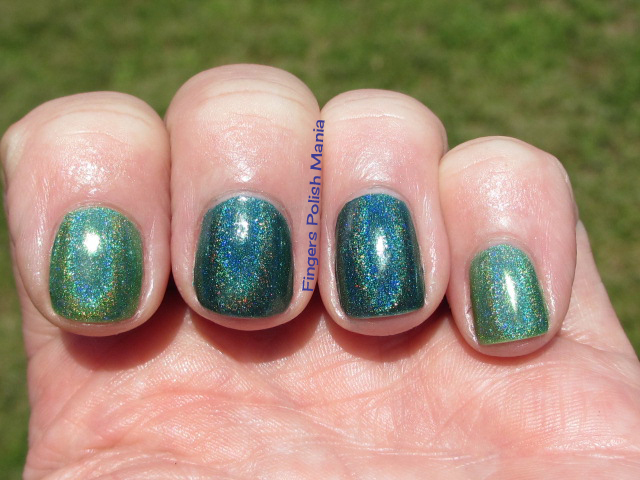 Today's mani has a new indie brand to me, Literary Lacquers and her fab holos. Here is the silly bottle shot. 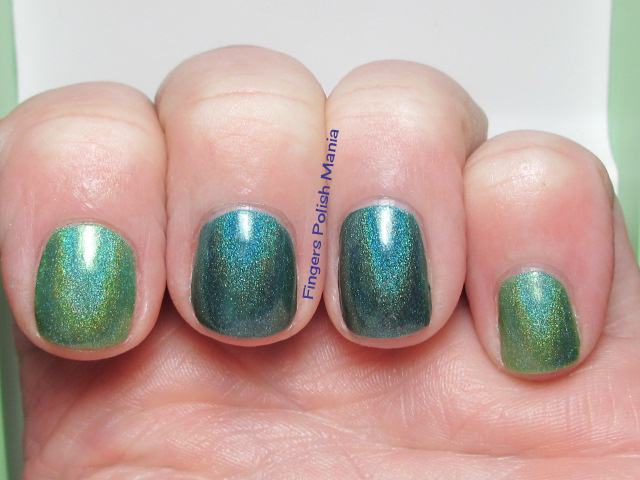 This is Literary Lacquers Lake of Shining Waters, Enchanted Polish Midnight and Literary Lacquers Green Gables. 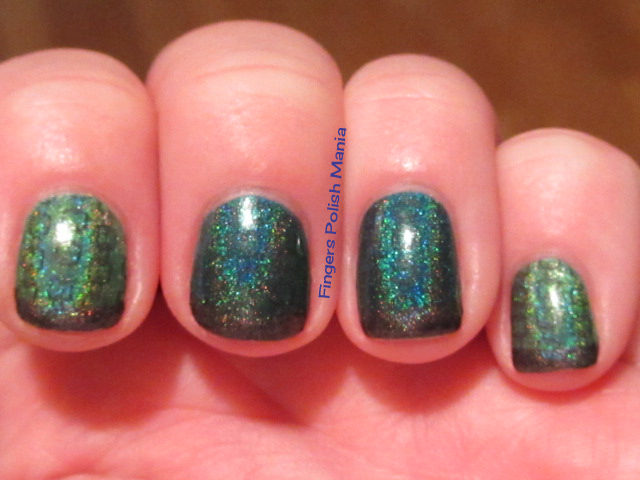 Yes my very first teal holo! 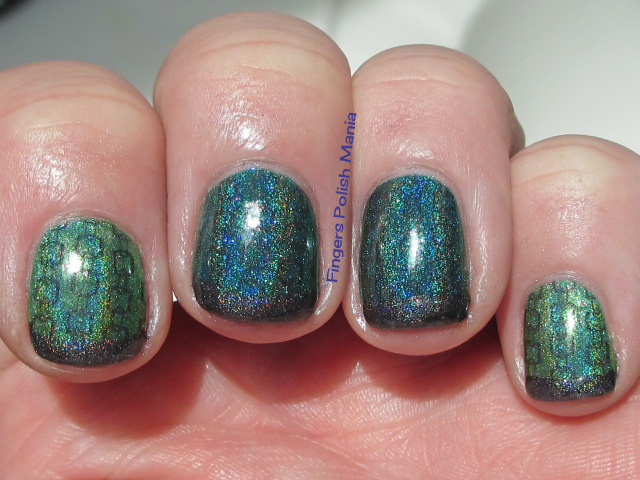 How very excited I was to realize that I did not have this color holo in my vast collection! I couldn't pick which one to start with so I just used both. I did the opposite on my right hand just for fun for me. Here are the starting shots. 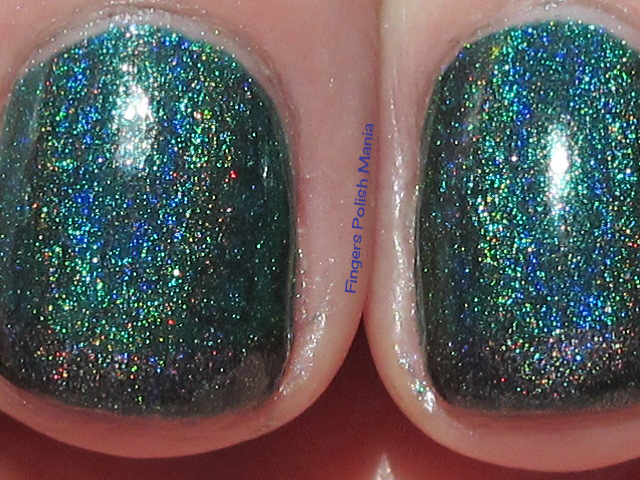 Did I fail to mention just how strong these holos are? I'm talking major rainbows here. 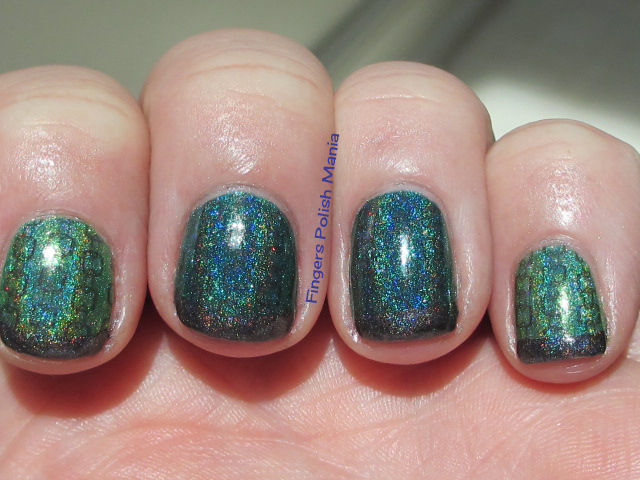 My only complaint is that these start off very sheer and no way was I gonna be able to stamp with them. That's where Midnight comes in. I used Cheeky plate 3 European Romance. It is very subtle and hard to see, which is my bad. The rainbows just block out all other stuff! How can that possibly be bad?? Hence my title chainlink love right? I finished this with my funky with Midnight again. Here are the results. Isn't this awesome? 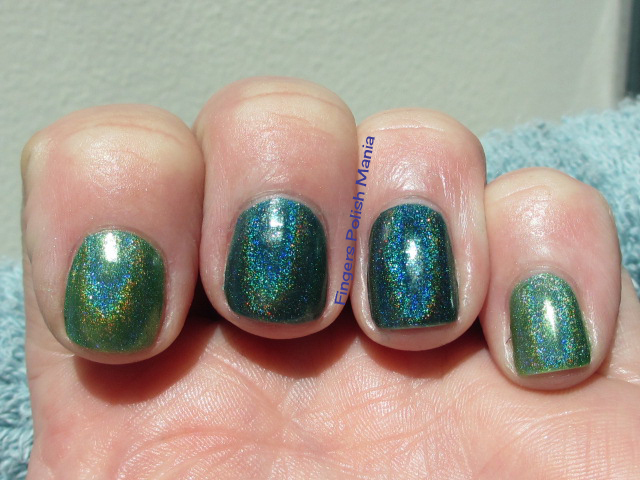 These are some of the strongest holos I own. I am in love with these two colors. So pretty and happy. Perfect for a bad day. Well I've got to go-today is hair dye day and that always makes me feel better!